Request a Quote for our Pressure Washing Services. Please provide details on the work to be carried out. or another local area, we can help your home or business look its best through the use of professional power washing services. So, what do we clean? You might be wondering just what we clean. We’ll use our pressure washing services to make the exterior of your home, including your roof, siding, deck, patio, driveway, fence, and pool area, look spotless. In fact, we’ll have your home looking immaculate in no time. At The Gutter People, we have professional power washers who are dedicated to making sure the exterior of your home or business becomes clean and beautiful. Our power washing will quickly and efficiently get rid of any built-up dirt or debris that’s plaguing you and your property. This helps it not only look amazing, but also reduces the wear and tear that’s caused by algae, mold, weeds, insects, and more. If you’re wondering how you can make your home look like its good, old self again, we encourage you to receive a professional power washing. We offer our services to those in Gladwyne, Villanova, Newtown Square, and Wynnewood, PA, as well as the surrounding area. You can learn more about the benefits of pressure washing and how it will help you by contacting us at 610-359-6358. Pressure Washing Services in the Main line area, We are equipped with Power washers for pressure washing roofs, exteriors, patios & driveways. [subtitle]Request a Free Quote for our pressure washing services. Pollution, nature and graffiti can make your home’s exterior look old and worn. The Gutter People’s professional water pressure washing services can restore exterior surfaces to their original, appearance. High-power water pressure washing may look easy, but your home is far too valuable to put in inexperienced hands wielding a rented pressure washer. The Gutter People’s skilled staff only uses professional-grade water pressure washing equipment to insure that your home exterior is cleaned without causing unsightly or expensive damage. We can visit you today to give you a Free, no obligation pressure washing services quote. Call us now to schedule an appointment – we have dedicated pressure wash service professionals available in your area of Montgomery, Chester, Philadelphia & Delaware PA Counties. Click here to contact us now or call us at (610) 359-6358. We have invaluable experience with all home exteriors, from shingles to stucco, paint to vinyl and aluminum siding. The Gutter People will pressure wash your home’s exterior without damaging it – even delicate surface such as stucco or paint. We remove moss, mildew, stains, dirt, cobwebs and graffiti with our Delaware, Chester, Philadelphia & Montgomery County pressure wash services. We also power wash fences, exterior walls, walkways, patios, decks (both wood and vinyl) and pool areas. Pressure washing services help eliminate slippery, mossy walkways. 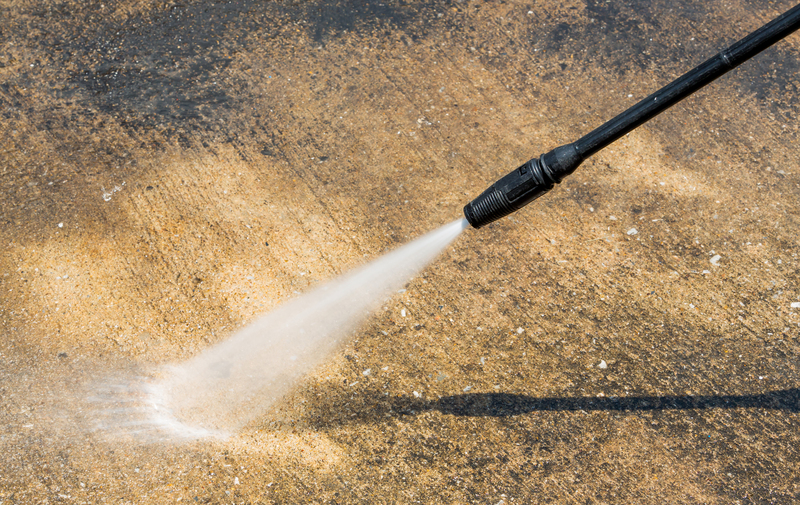 Pressure washing can safely clean walkway surfaces made of concrete, brick, stone or wood and restore the surface to it’s natural, safe, high-traction state. We provide power washing service for both residential and commercial properties throughout the Delaware Valley, Montgomery, Chester & Philadelphia PA Counties. Click here to email a pressure washing specialist now or call us at (610) 359-6358.